Seventeenth-century Japan: Two Portuguese Jesuit priests travel to a country hostile to their religion, where feudal lords force the faithful to publicly renounce their beliefs. Eventually captured and forced to watch their Japanese Christian brothers lay down their lives for their faith, the priests bear witness to unimaginable cruelties that test their own beliefs. 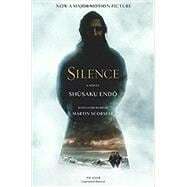 Shusaku Endo is one of the most celebrated and well-known Japanese fiction writers of the twentieth century, and Silence is widely considered to be his great masterpiece. SHUSAKU ENDO, born in Tokyo in 1923, was raised by his mother and an aunt in Kobe where he converted to Roman Catholicism at the age of eleven. At Tokyo's Keio University he majored in French literature, graduating BA in 1949, before furthering his studies in French Catholic literature at the University of Lyon in France between 1950 and 1953. Before his death in 1996, Endo was the recipient of a number of outstanding Japanese literary awards: the Akutagawa Prize, Mainichi Cultural Prize, Shincho Prize, and the Tanizaki Prize, and was widely considered the greatest Japanese novelist of his time.